National Agricultural Research System (NARS) of India comprising Indian Council of Agricultural Research (ICAR) and State Agricultural Universities (SAUs) is entrusted with development of high yielding, high quality and climate resilient varieties suited to different agro climatic conditions of the country along with matching production and protection technologies has taken several initiatives through its 26 and 30 commodity/theme based research institutes and crop specific All India Coordinated Research Projects (AICRPs) and All India Network Projects to enhance productivity of different crops. The present paper discusses the genesis of AICRPs in field crops, their organizational set up and operation, variety release and notification mechanisms, outputs and outcomes. Multi-disciplinary and multi-location approach and success of first All India Coordinated Maize Improvement Project established in 1957, led to establishment of 21 crop based All India Coordinated Crop Improvement Projects (AICCIPs) and 2 All India Network Projects (AINPs) beginning with wheat (1961) and rice (1965). Later on, AICCIP was rechristened as All India Coordinated Research Project (AICRP). 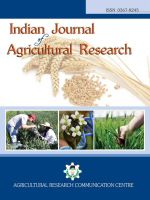 The AICRPs served as platform for analysing G x E interaction leading to identification of stable potential genotypes and played an important role in the development of 4,365 varieties of field crops along with efficient crop management technologies suitable for diverse agro-climatic conditions. Of these, during XII plan (2012-16), 698 varieties comprising 396 of cereals, 108 of oilseeds, 91 of pulses, 49 of fibres, 31 of forages and 23 of sugarcane were developed. Development of high yielding, stress (biotic and abiotic) tolerant, location specific varieties with matching production/protection technologies, enhanced availability of quality seed, their adoption coupled with enabling policies, excellent service support and innovative farmers resulted into spectacular increase in cereals, pulses and oilseeds production since the inception of AICRPs and Value for Cultivation and Use (VCU). Food production rose from 69.86 million tonnes (1956-57) to 252.22 million tonnes (2015-16) and oilseed production from 8.56 million tonnes (1965) to 25.9 million tonnes (2015-16), increase was 261 % and 202.5%, respectively, a testimony to the spectacular success of AICRPs and VCU system in India. AICRP, Food Production, Field Crops, Network Project, Oilseeds, Value for Cultivation and Use.